I picked this soup because it's fresh, make use of that lettuce which has been waiting all its live in the fridge and it's .........very green, cooking lettuce might sound a bit weird but once cooked the taste is not much different from raw: very mild flavour with a certain sweetness, here enhanced by the peas and the caramalised bacon. Remove the bacon and reserve. Replace by the lettuce, it will wilt fast, after a couple of minutes add the peas, salt and pepper to taste, the stock and simmer for 10 minutes. Pour in a liquidiser or use a hand mixer and process. At this stage you have two options : serve or sieve and discard the shelves of the peas. The latter is my favourite, it doesn't lose its consistency and it's smoother. 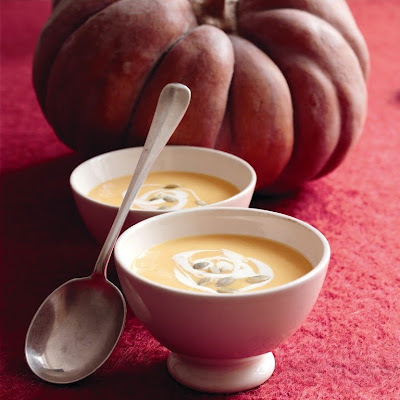 Let the soup cool. 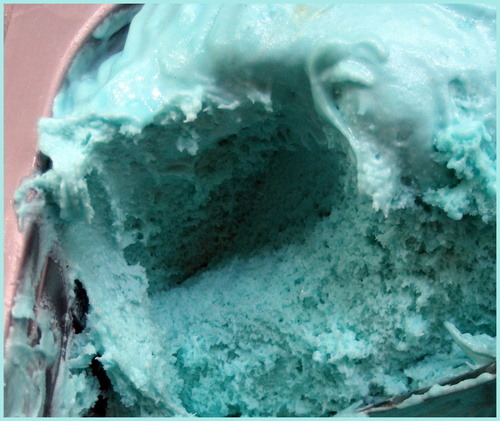 At the start of the month, I wrote an article for Great British Chefs about Gelato. Articles written for magazine are very different from these on the blog, they are less personal and target another audience, so you might be interested in reading it here. I read the other day that "until food bloggers were treated as paying dinners, then readers couldn't expect objective reviews". Don't you love these dogmatic statements? in my world nothing works that way. 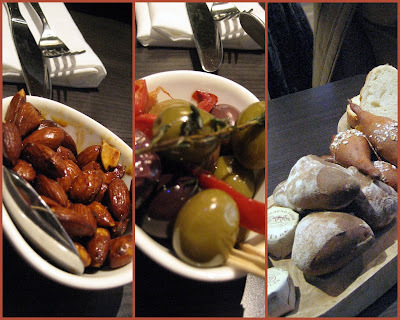 Last week Michelle as in Greedy Gourmet invited five food-bloggers to join her for lunch at Brigade The Fire Station in Tooley Street where she was doing a photo-shoot. Our dining experience was very different from anyone else as the restaurant was closed to the public. So no, I will not be able to comment on the hustle and bustle of the place when the restaurant is full, is it noisy? I don't know. Neither can I talk about the service when the front of the house is under pressure and it all become a little manic. But what I can tell you is that in these few hours, we learnt a lot about what makes this place what is it, from the staff and from Chef Simon Boyle who together with Beyond Food foundation offers 6 weeks training programmes to people who have been at risk or have experienced homelessness. Then, trainees who make it through join a year programme. It's one thing to know that Brigade is a social enterprise, it's another to see the eyes of the staff quietly light up and a shy smile or two appear when they talk about a possible future of working to high standards in a professional kitchen. And this pride is reflected in the cooking. 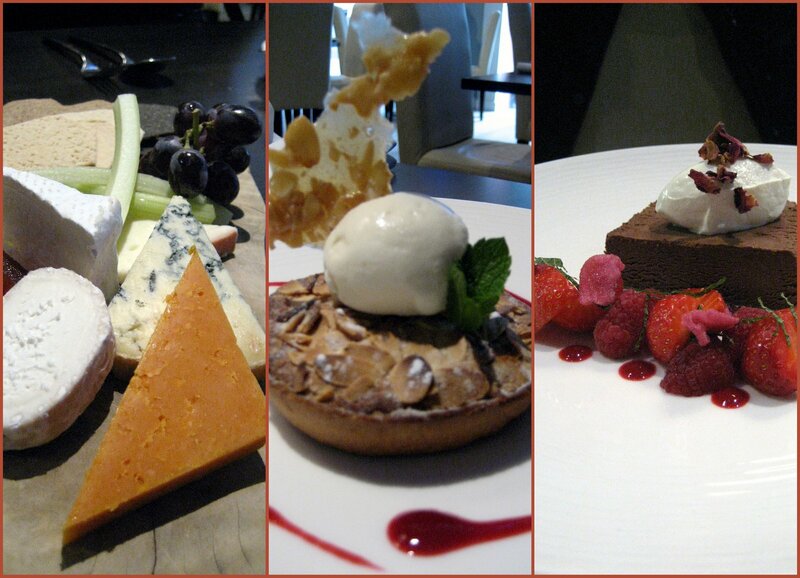 Yes, the ingredients are sourced locally, chosen with care but they are also presented beautifully. I will not rave about my starter, Scotch Eggs (£8.95) but I could certainly go on about the inventiveness of the complement. The Piccalilli was not that horrid mustard coloured pickle instead it was fresh fennel, green apple tinted red by glorious beetroots. No doubt Brigade is expensive, my main course Raviolo of Lobster and Salmon (£19.95) was too salted for my taste but Jeanne as in Cook Sister loved hers. The apprentice chef who created it, talked me through the process with confidence. So, sure, I would have preferred a little less salted but still it was perfectly executed. As for my friends, there was no way of knowing exactly what Sarah of Maison Cupcake thought of her Pork Belly Toad in the Hole (£16.95) as all we could get from her was "YUUM" repeated as a mantra between mouthfulls. May who blogs on Eat, Cook, Explore was impressed with the unusual and delicious combinaison of her Fillet of Beef and Figs (£29.95) when I say "her", in fact it was somebodyelse's, as two fillets were ordered with various degrees of cooking and each was served to the wrong person. At that stage we were so impressed by the food that it didn't seem to matter too much. It has to be said that sides are often an after-thought but not here. At Brigade, the sides rock. The Tossed Autumn Salad (£3.25) was garded jealously by Fiona -London Unattached- who after a few days on a French press trip needed a lot of salad, so she told us. We ended up trying out must of the vegetable dishes, each of them made with crops which are at their best during September: Sauteed Chard with Hazenut butter, Deep Fried Broccoli, personally I loved them all. Something else which impressed us was the wine list. Advised by Jeanne, our token sommelier, I discovered one of her favorite South African white, Kleine Rust and what a wine this is. Brigade is conveniently located by London bridge, the quality of a meal is undeniable, the service is good. It's expensive for a bistro but you are giving to a cause whilst enjoying an innovative dishes executed with care, in the process. I was a guest of Brigade. No matter how big kitchens are, they're never big enough. Have you notice how there is not a day spent without hunting or fishing for the peeler or the wooden spoon. So after 6 months in Pebble Soup's new kitchen, "things" have more or less found there places but it's time to do a bit of research in utensils management. A flower pot had been used for a while though smart as it was, it soon became too small and was for ever tilting. That's when OXO Good Grips came to the rescue and sent a Rotating Utensil Holder. 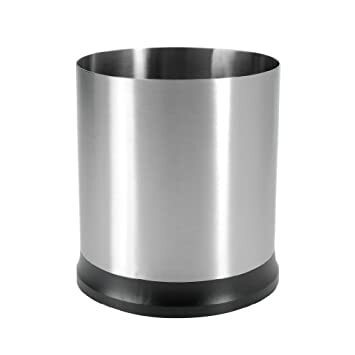 +Being stainless steel it fits well in the new kitchen and would look good in any kitchen. +The rotating system is useful and the whole thing feels very solid, no tilting here. +The Utensil Holder is large enough to hold over 15 large-handled tools. -Finger marks quickly show but so do they on a lot of other stainless steel kitchen gadgets. 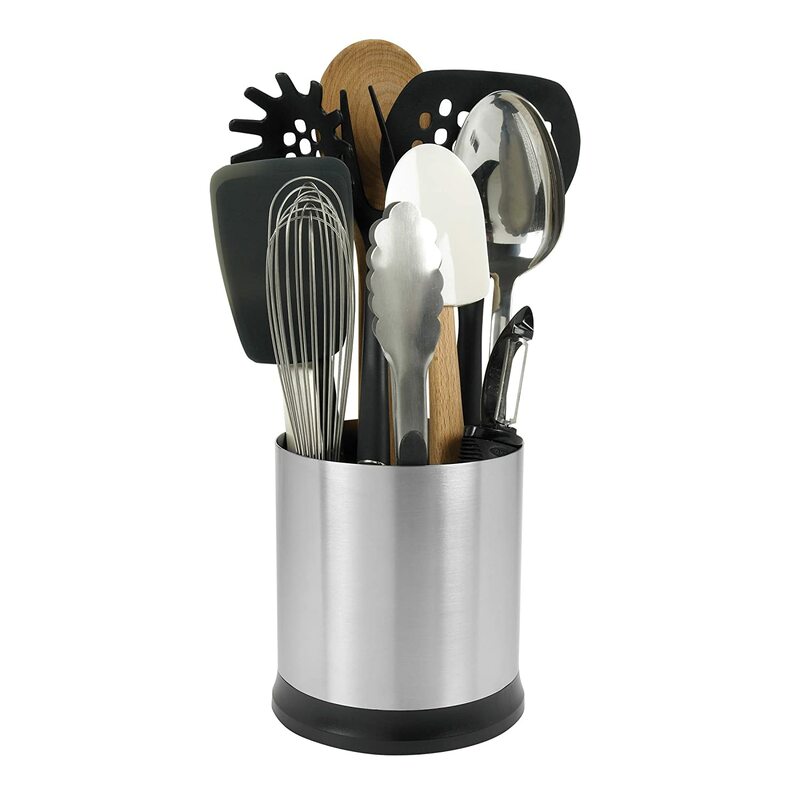 If you don't want to dig in the drawers any longer, here is your chance to win one OXO Good Grips Rotating Utensil Holder (as shown below utensils not included) RRP £20. Sourdough Bread has been on Pebble Soup's agenda for a very long time. The interest stems from the book reviews which I used to write, way back, for the now defunct "Paper Palate". Reviewing "Crust" by Richard Bertinet, I probably missed a lot of details, I remember being fascinated by the process described in the CD. This is a book I would recommend if you are serious about making bread. If it took me such a long time to make a sourdough bread it's because of the starter. The starter is a natural ferment which gives the bread its carateristic flavour. There are other issues working with sourdough, time is an important consideration. The process takes days. But as he said there is something very pleasant about the slowness of the fermenting process. So after a few days, you end up with 2 portions, one which is discarded but not killed another with which you work with. The end result is a delicious thick crusted bread which will remain fresh for 3 to 4 days in a tea towel then can be toasted and still delicious. After 24h the "dough" is divided into 2 (this is when I got mine thanks to my neighbourg who gifted me the second half) but usually the other portion is kept, fed and the whole process starts again. It can also be dried. So the half is worked with more flour and more water and left for 12 hours. Now the ferment is ready, bread can be started. Turn out the dough, knock it back, divide it into two, prove it again for another 3 hours, Score and bake. I will be back with a recipe for Focaccia Sourdough which is a brilliant use of the second "portion"
Proud as Punch, Pebble Soup First Ever Sourdough Bread. Near St James tube station, a stone's throw away from the Houses of Parliament, Camilla Goddard is keeping bees for the St Ermin's Hotel. Confession time: I don't think I like honey very much. On the other hand, like for many people, insects societies are a source of fascination. No doubt that urban beekeeping is on the increase. Either for ecological reasons: bees are dying out in the wild therefore keeping bees has become important; for financial reasons, it will take only two years to get the initial investment back and start making money from honey. Out of interest, be keeping is very educational at many levels. 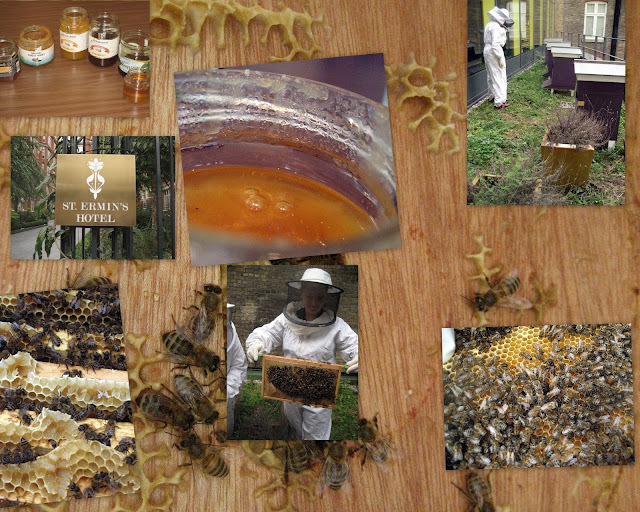 Not only individuals has started keeping urban bees, shops like Fortnum & Mason or hotel like the St Ermin's do too. The St. Ermin's' rooftop hotel is home to 200,000+ Buckfast bees, a good tempered honey bee, who reside in three custom-built hives. If you are interested in the subject, you'll need a bit of advice. Throughout September, every Tuesday, The St Ermin's hotel runs a beekeeping workshop. It's a two hours session where Camilla Goddard packs in all what is needed to know and more about keeping bees. It's a fascinating workshop with hands on and a cocktail the end for £15. I was invited to attend and I thoroughly enjoy every single minute of it. Disclaimer: thank you to the St Ermin's for asking me to participate, I was not requested to write about it, I only did so because I think that this is a valuable workshop which deserves all the promotion it can get.